So, this seems to be the 2018 Phillies’ season template: Get good starting pitching, rely on a few home runs, and then hang on to see what the bullpen yields. Through nearly half of their schedule, the Phils are 41-34, 2.5 games back in the National League East behind the division-leading Atlanta Braves (44-32) on June 25. But the thing is, they could actually be better, and have shown they could be better, if only they don't trip over themselves. If this young team has aspirations of reaching the playoffs, they'll need to start showing they can hang with teams like the one they'll be hosting this week, the New York Yankees (50-25), who share the best record in the majors with the Boston Red Sox (52-27) and Houston Astros (52-27). And doing so will require playing complete games. Something they've failed to do recently despite a capping off their fourth-straight series win over the weekend by taking the first two games of a weekend set in Washington. But on Sunday night, the Phillies blew a four-run, eighth-inning lead on national TV to the flailing, beat-up Nationals, a team that they should have swept. That loss came six days after blowing a two-run, seventh-inning lead against the St. Louis Cardinals, another team that they should have swept. For a team that seems capable of winning the National League East — especially if they add a veteran or two before the July 31 trade deadline — excuses seem to abound after they fail to close out winnable games. 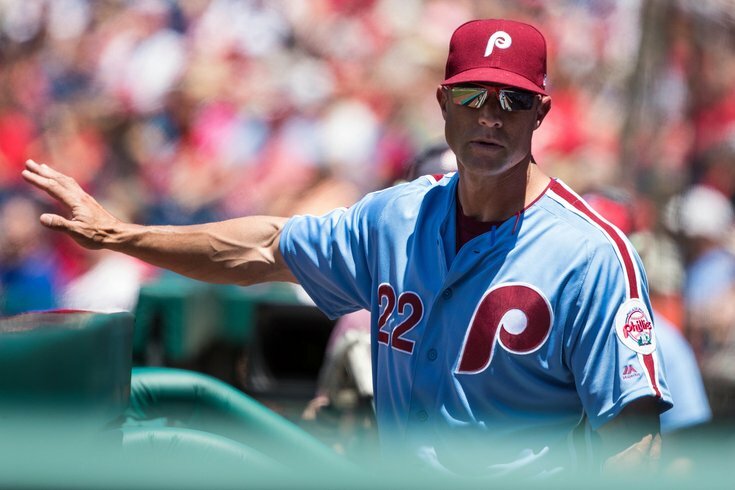 "I think that every series that we win, it's less, ‘If they keep this up, it proves they are good’ kind of thing," Phils’ manager Gabe Kapler told reporters on Sunday. "Rather every series we win, we feel more confident that second-half development leads us into the playoffs. "That's how I am thinking about it. We have young players on our roster, right? A lot of 25-, 26-year-olds. If they all do what their natural curve should do — get a little bit better in the second half — theoretically we are a developing team that is getting better. So, I can see us getting even better in the second half." However, the fact remains that the Phillies should have swept the Nationals, who were were 4-8 over their previous 12 games entering the weekend. And when when you consider that they did not face Max Scherzer or Stephen Strasburg, who is on the disabled list, and that their two sluggers — Bryce Harper, hitting .213, and Daniel Murphy, hitting .103 entering the series, had been struggling — it looks like even more of a missed opportunity. That was a Nats team that the Phillies could have kicked when they were down — but didn’t. And being satisfied after “taking another series,” when a sweep was blown, could be haunting. On May 28, when the Phils embarked on this stretch of 32 games against the upper echelon of Major League Baseball, they were 29-22, three games out of first place. So far in this stretch, they’re 12-13 with the Yankees and Nationals left — all seven games at home, where they’re 24-13, tied with the San Francisco Giants for the best home record in the National League. If they're able to finish this stretch and still be seven games over .500 (meaning they went 16-16 over those 32 games), that may be seen as an accomplishment. But when talk of playoffs begins to rise, a larger picture should unfold, and expectations should be raised. On the season, the Phillies are 23-25 against teams over .500. Take away Sunday’s loss to the Nationals, the squandered chance to sweep the Cardinals in the June 19 loss, and the nightmare 7-5 walk-off loss to the Chicago Cubs on June 6, they would be 26-22, which translates to 44-31 overall. And they'd be sitting in first place in the NL East. Whether it was Kapler’s decision to pitch to Murphy, instead of 19-year-old hitting phenom Juan Soto in the eighth inning, or a bullpen that imploded to give up nine hits and six runs in the last four innings of Sunday’s 8-6 loss, it would be good to find an answer — and fast.